A trio of galaxies form what appears to be a wry smile in deep space in this view from the Hubble Space Telescope. This close-up image shows galaxies from the SDSS J0952+3434 cluster. The universe, it seems, is pretty pleased with the Hubble Space Telescope. I mean, just look at that smile! And so, the universe smiled. 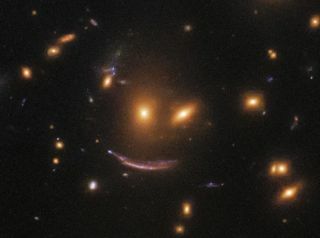 The arc of that smile is due to gravitational lensing, as NASA and the European Space Agency explained in a statement: "The lower, arc-shaped galaxy has the characteristic shape of a galaxy that has been gravitationally lensed — its light has passed near a massive object en route to us, causing it to become distorted and stretched out of shape." This Hubble Space Telescope photo shows a wide view of the galaxy cluster SDSS J0952+3434, which includes three that form a cosmic smiley face. This photo was captured by Hubble's Wide Field Camera 3, which astronauts installed during the last servicing mission to the space telescope in 2010. ESA officials released the image on Oct. 15, and NASA showcased the space smile on Nov. 2. The Hubble Space Telescope is 28 years old. It launched into space in April 1990. "Hubble captured this image in an effort to understand how new stars spring to life throughout the cosmos," NASA officials said. "WFC3 is able to view distant galaxies at an unprecedented resolution — high enough to locate and study regions of star formation within them." This isn't the first time Hubble has captured a smile in space. Seeing faces in space is nothing new. But that doesn't mean the universe is trying to cheer us up. The phenomenon is called pareidolia, and is when we see familiar shapes or patterns in objects that aren't actually there. The iconic Face on Mars photo from NASA's Viking missions is a famous example of pareidolia. Editor's note: This story was updated to correct the age of the Hubble Space Telescope. It is 28 years old, not 18 years old.